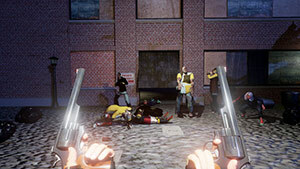 ZombVR is a zombie-themed first-person shooter, where players venture through a zombie world either alone or with friends in co-op mode. You can upgrade your weapons, unlock new areas, fight against bosses and more. The game features realistic cover systems, long range and melee weapons, survival elements and even competitive online multiplayer mode. ZombVR is a zombie survival FPS for the HTC Vive. The game features a single-player and co-op modes, as well an online multiplayer mode in which you can your friends or other online players. Unlike many other zombie shooters which a stationary, in ZombVR you can actually move your character and interact with the immersive environment it offers. Yet, you still get to enjoy all the great action of killing zombies using your pistols and melee weapons. The weapons themselves are upgradable as well. As of the time of writing, the game is planned for Early Access via Steam on September 2016, and the developer mentioned that he is working on a new sniper rifle, which you can use to take out zombies from a long range. The shooting and cover system mechanics work well, allowing you to take advantage of the various objects that are spread across the world for cover. Shooting with a dual pistol is really fun and its great that there are also virtual hands attach to the weapon, giving a more authentic feeling when shooting the weapon, compared to other many other games that just show the weapon. ZombVR also features some nice VR mini-games which you can pass your free time, something less stressing. From what I understand from the official website, all the developer games were developed using Unreal Engine. The game visuals are nice, but that's about it. The use of lighting is done right to create a dramatic effect, but I have to say that I did really like the gun and melee weapon design. Keep in mind that as of the time of writing this preview, the game is still in Early Access, and many things can change when the game is officially released. The game will launch with a Round based single-player survival mode, mini-games, a shooting range, two playable areas, three pistols and five melee weapons, all are upgradable. In an upcoming DLC, which will be free, you'll get to enjoy a new Sniper Rifle, a multiplayer co-op map and one map for 1v1 / 2v2 competitive multiplayer mode. In the extra DLC, the developer plans to add four new survival maps, three new MP maps, more weapons, including a crossbow, longbow and grenades and new mini-games. It looks like the developer, Donkey Won Games, is putting a lot of effort to make zombVR an all-around great zombie shooter, which everyone can enjoy playing, along or with friends. If you visit the developer's website at donkeywon.com, you can see in the footer that the developer is committed t listening to the gamer's feedback and making sure that their opinion won't go unnoticed.